I try to keep my posts all about one thing and not mix up too much, but today I thought I’d break my own rule. First of all, I said in my WIP Wednesday that I’d post a photo of my latest finished project. It is a Lush cardigan by Tin Can Knits and it was a lot easier to make than the last one I did! It’s in the same colour, with different buttons. The photo is totally rubbish because it’s hard to take a good photo of a flat cardigan! The recipient has now seen it so I can post a photo, I’m just hoping it fits. What I want to know is how do you deal with the fickle nature of Instagram? Do you just not worry about losing followers as it’s better to just have those who are interested and not just following to get a follow back? Does it bother you when your stats seem to drop? I guess because I’m not relying on it for a business it doesn’t matter so much. I can see how young people can really be influenced by it, and get anxious about number of likes etc. I think I’m just bewildered by how much and how quickly things change on there. Maybe I’m not playing the game right! What’s your approach to Instagram? Do you have any tips for playing the ‘game’ or do you just make up your own rules? Am I alone in my confusion? I’d love to hear what you think. I have also been asked for money to share my work or have people comment and like for days on end so I follow them back in the end and then I get private messages to offer random things for sale. I’ve grown a thicker skin but it still bugs me. Social media can be a total pain (don’t get me started on Etsy if you ever go down that road). Blogland is a much nicer place to be. Ooh, your stuff is lovely. If you fancy Etsy then you should – I’m sure it would sell. A lot of it is trial and error but have a read up on how best to make a listing (getting title written to be seen etc and using tags etc). I put listings up and didn’t really have a clue what I was doing and now I’m trying to go back and sort them out but it is a painful process. I just started using instagram. I follow friends, and other accounts that I like…if they follow me back, fine, if not, I don’t worry about it. I’m not doing it for a business though, so I’m not really all that worried if I have followers or not. I’m sure I would feel differently if I were trying to attract business, but since I’m not, I don’t let it stress me out. Love the Brussels sprout by the way, it’s adorable! Yeah, I’m still trying to figure out how to navigate there, lol. I have no ideas for social media. I have recently opened an Etsy store after prompting from my friends. No sales yet but I’ll try it for a little while and see how I go. I need to add a few more items in the next week or so. As all this crafting is a hobby I’m not pinning making money from it. Hope you do well with your sales. Second- I am totally with you on the Instagram conundrum. I have been thoroughly confused about the loss of followers. I had been so close to getting to 500 and then it would dip back down, then up, then down. I was just so confused about how the numbers were changing so much and why so many people were unfollowing me. What you said makes perfect sense- that a lot of people are just following to get you to follow them. I agree that I don't want to follow a bunch of random people I'm not interested in just for the sake of gaining followers. I'd rather have a good group of pages to follow and people who are genuinely interested in what I post than have a high number of zombie followers lol. Lol! That’s one I hadn’t heard of! That’s a lovely cardigan! I have a love-hate relationship with Instagram. I love putting the pictures there almost every day, because every day I usually have something new to show and not that many people to show it to in real life. It also made me so much better at photography, because I’m trying to attract followers. To be honest, I only had 1 sale thanks to Instagram, and I’m there since…March? Love the cardigan and I am sure the receipient will love it. I don’t offer things for sale and I don’t use Instagram, but I do buy stuff! If I like something a blogger is making and I have someone I would like to buy a present for, then I will buy. If I am looking for something specific I go to Ebay!Have you thought of Ebay, then you don’t have to worry about followers! Lol! I feel a little inadequate at times, but then I remember it’s a hobby for me and that I also have a day job so I can’t be taking photos all day long! Now, I’m sorry I don’t know anything about Instagram. It sounds like a hybrid of Facebook and Pinterest?? I have thought about getting an account for my business but don’t know if it’d be worth it. Your cardigan is really lovely! 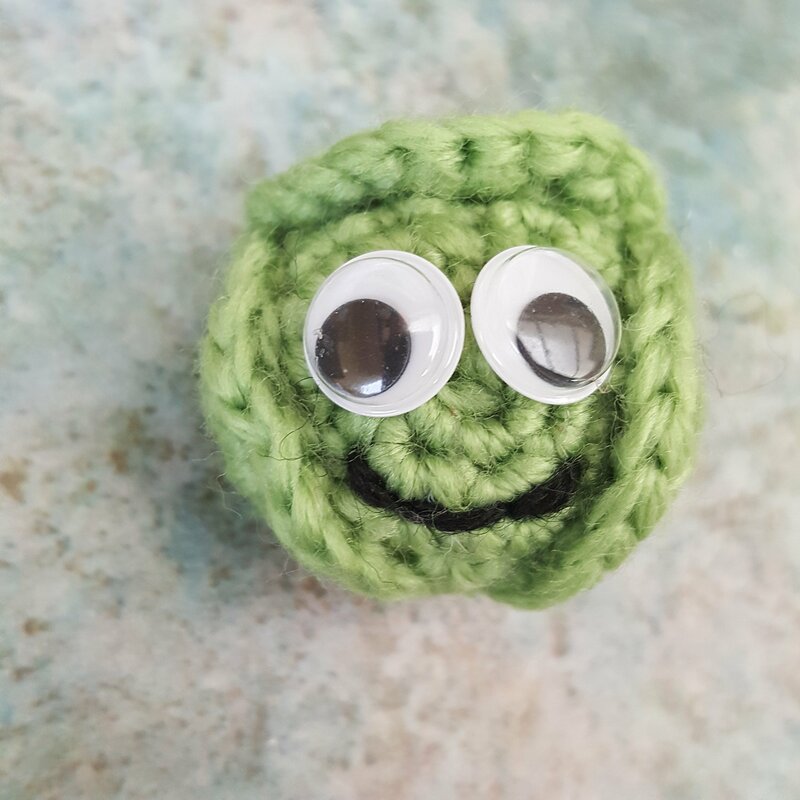 And the sprout is a great, funny little ornament. Every day I read about IG doing this to people. I personally have given up looking at my IG numbers because of this. Like you, I don’t follow for follow, so will only follow what looks to be of interest to me. I have almost given up on IG anyway, so it’s not going to bother me! Good luck with your shop. Thank you. I try to avoid the numbers but then when it updated it shows me the numbers when I first open the app. I have the same approach to choosing people to follow! 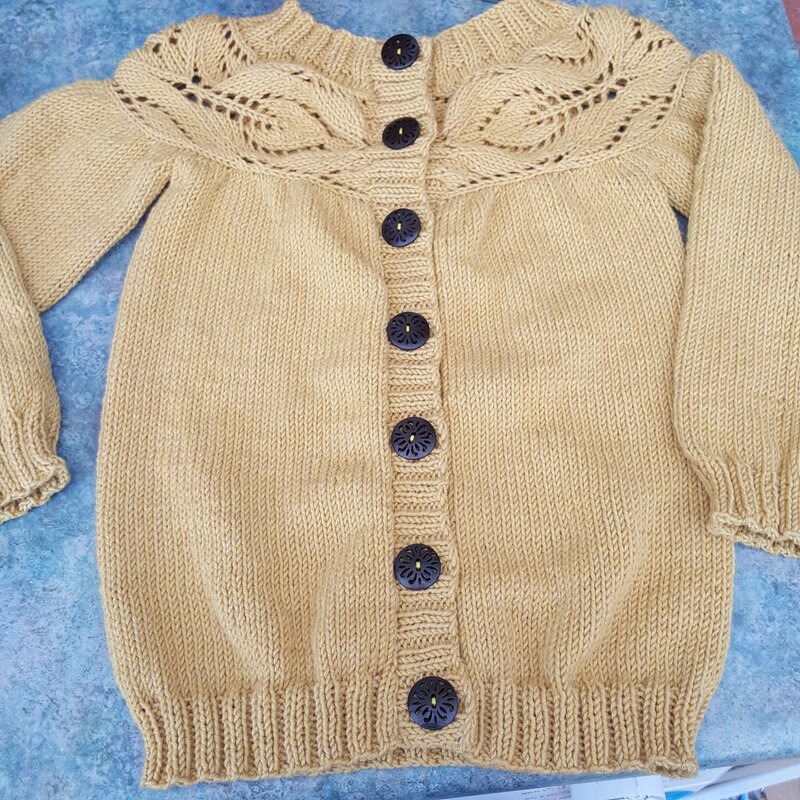 The cardigan … is even more lovely than I imagine it to be. It looks sooo soft. Like it would hug you as a Teddy Bear would hug you. It looks so delicate with all that lacey pattern at the top. So beautiful. I love your sprout! I don’t do Instagram, not least because we have such poor phone signal at home. I tried it once and felt inundated by an endless stream of photos. It reminded me of playing pooh sticks with the danger of offending people if you miss liking their stick as it rushes by! I love that analogy! It does feel like that sometimes. So love your cardigan knit Mrs C.. and you seem to have completed it in record time. That little sprout so cute.. As for Instagram.. Thankfully I am not a member or on FB.. I have all on keeping up with those whom I follow on here. But I feel it is the same on WP too, like yesterday I got 15 new followers, but no one ever introduces themselves.. I have often left messages of thanks for the follow and many do not even respond.. So over the years of blogging I have not followed like for like unless I feel their content something I am interested in.. I gain some and lose some all the time.. But the real friends of WP click like, and comment and visit when they can… I know its impossible for me to get to comment on every post of every blog I follow, so never expect the same.. But I am happy of the time given when they can.. I know we have built up a friendly community here on WP and enjoy my blog time..
On another topic, the weather here has turned Autumnal all at once… Hubby managed to get the rest of the potatoes out before it rained this morning.. So that is one good thing..
🙂 I made Yellow tomato soup this morning, we had an abundance of small yellow ones, so made a huge pan and will freeze half.. Along with some Cheese and Onion Pasties.. So looking forward to lunch.. And by the way the night draws in Candles are needed lol 🙂 You too, take care Mrs C.. Sounds delicious! I made cheese and onion pasties at high school and I’ve never managed to make such lovely ones since. I cheated today.. I bought a roll of shortcrust pastry already rolled.. cut into four squares , filled and shaped them.. 🙂 easy.. Lol.. I pretty much hate instagram lol. I post a photo every now and then for my etsy shop and like some of the pictures on my feed (I only follow things I like/ people I know) but I rarely pay attention to the people who follow me as they always unfollow again. Aw, I only follow things I like or people I know too usually! I don’t bother about people unfollowing me on instagram; if they’re not interested in what I’m posting then it makes sense. And I’m pretty picky when it comes to me following other accounts. I have to like what they post first of all, and I also look at how interactive they are and how many people they follow compared to their follower numbers. I guess I’m looking to support the underdogs! Thanks. I love your attitude to Instagram, I tend to just follow people whose work I like. When a private account follows me I always feel a little odd about following back, like if you have to request to follow them it feels intrusive. Honestly, my approach to Instagram is to not use it at all. Although it allows you to interact with messages it is not personal enough for my taste. You’re getting followed and unfollowed as well as likes on your photos because those are the main ways in which people express – in a primitive way – what they think about your content. On Instagram people upload photos to see how many likes they can get on the photos, mostly. I tried it out and got bored with it. I wouldn’t worry much about statistics on any site. I think a good exercise to try if you tend to think about them is to challenge yourself not to look at them for a period of time, say a week or two. The kind of work you’re trying to sell isn’t all about social media although you need that to let people know you have things for them to buy. For all of us interested in crafts, whether it’s just a hobby or related to products we wish to sell, it’s important to remember we’re in a “niche” area that doesn’t interest a big portion of the population. People are far more aware of and into Starbuck’s, Carolina Herrera, etc. Also, in general, popularity comes in waves because you aren’t Carolina Herrera. You’ll no doubt come up with something one day that is liked and shared to death and another day come up with something that isn’t received with so much enthusiasm. I feel the same way as far as Instagram goes. I used to get really worried about losing followers, but I have relaxed a bit on that. I now follow people whose photos I want to see. 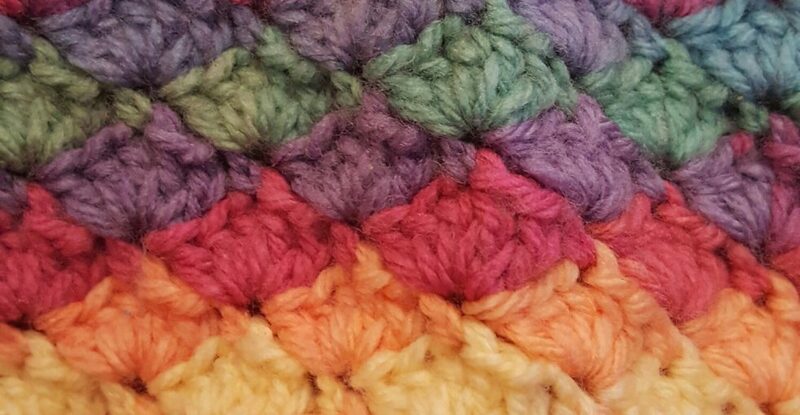 I use IG mostly for my crochet so I follow a lot of creative people! I don’t do Instagram but certainly as far as my blog is concerned I just follow things I like. If someone new becomes a follower the I will have a quick look but whether I decided to follow them or not depends of if I like what I see. If I follow then I do try to leave comments, though sometimes time runs away from me. I was taught if you cannot say anything nice then best say nothing, so that being that, what is the point of following something you cannot say nice things about lol. I like your approach to it all, I only follow blogs I’m interested in too. I am guilt sometimes of missing notifications of new followers and not looking at their blogs, I must work on that! Instagram is both so incredible inspiration and frustrating. When I realised that someone would follow you just to unfollow you the next day, I felt a bit tricked – not that I’m concerned about my follow numbers, but I don’t like being used either. Thank you, you put it so well-it is like being used! I think that’s why it annoys me. You’re definitely not alone in your confusion. I’ve almost given up on Instagram 😕 I love it here in Blogland 😊 It is a much nicer place. Lol! Yes I get the exact same feelings. I’m not sure I could call the sprout chuckle muscle, it’s a tad rude 😂 The cardigan was done in 9 days which is definitely a record. My kids signed me up for Instagram….I am totally buffaloed by it and really have no idea how it all works. This might be good as it is hard to stress about something when you really haven’t a clue lol! Lol! It’s not worth stressing about, I really don’t know what the rules of the game are! Your cardigan is beautiful! I’m impressed, that’s a lovely pattern and it looks very sophisticated. I’m very happy I landed here and could read all the comments about Instagram. A friend pursuaded me to use this plattform and I must admit, I feel very much the same as you. It’s frustrating! And I thought it was going to be fun. Or at least put a smile on my face . 🙂 Followers coming and going like the wind. It’s something that I watch on WP too. If I get a new follower on WP and the person doesn’t like my work or write a comment I expect him to unfollow quite soon. Have a great weekend. Thank you, I think you’re right about the new follower thing. A lot of the time I get followers but no interaction. I try to like, read and comment on posts at least some of the time on every blog I follow. (I’m really behind lately!) The cardigan is a nice pattern to follow, but very technical I’m places! Hope you’ve had a lovely weekend.